In the Georgia House district that hosted a special election on June 20, "Trump won by 20+ points." By Louis Jacobson on Wednesday, June 21st, 2017 at 12:34 p.m.
How big was Donald Trump's 2016 win in Georgia's 6th Congressional District? We took a closer look. 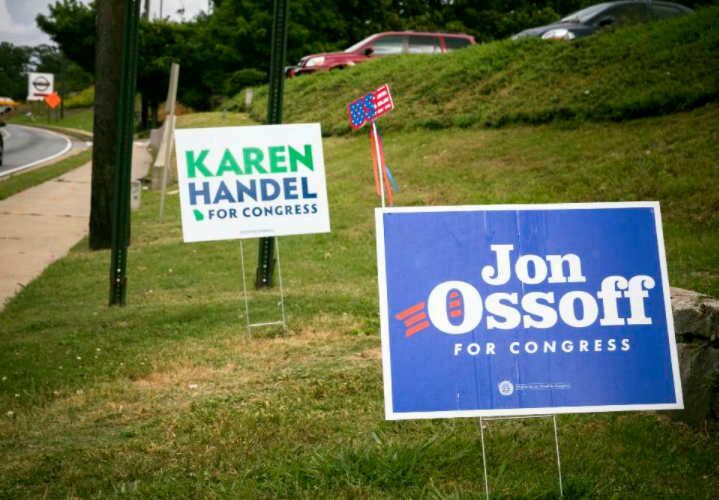 After Republican Karen Handel defeated Democrat Jon Ossoff in a closely watched special election for a House seat in suburban Atlanta, commentators in both parties began to spin the results furiously. One of them was Joy Reid, the liberal host of the MSNBC show AM Joy. On election night, not long after it became clear that Handel had won a narrow victory, Reid reassured her followers on Twitter, "It’s GEORGIA. A Republican district in Georgia that Trump won by 20+ points. Let’s hang on to some perspective, folks." Reid is right that the district is historically Republican; Republicans have held it for decades, most recently by Tom Price, whose elevation to Health and Human Services secretary by President Donald Trump prompted the special election in the first place. Another source of presidential results by congressional district, Daily Kos Elections, had a similar number, putting the Trump margin of victory at 1.5 percentage points. Like a number of other traditionally Republican suburban congressional districts across the country, Georgia’s 6th District moved toward the Democrats in the 2016 presidential election. Political analysts credited Clinton’s gains in such districts to demographic patterns in each of the candidates’ bases of support. Hillary Clinton tended to do better than Trump did among voters with high educational attainment, who are disproportionately numerous in suburban districts like Georgia’s 6th. In some such districts, Clinton won outright over Trump. These included Texas’ 23rd District, held by GOP Rep. Will Hurd, and no fewer than seven Republican-held House districts in California. Georgia’s 6th District didn’t quite give Clinton the victory, but Trump notched only a narrow win in the district. The 2016 presidential result in the district was far worse for the Republicans than in previous elections. In 2012, according to the Almanac of American Politics, Mitt Romney won the district, 61 percent to 37 percent, a 24 percentage-point margin. That margin is more along the lines of what Reid was talking about. But 2016 was a very different election year from 2012 in the district. Georgia’s 6th District had already moved substantially in the Democrats’ direction by last November. Clinton won some 40,000 more votes in the district than President Barack Obama did in 2012, while Trump won almost 27,000 votes fewer than Mitt Romney did in 2012. Worth noting: Even as Trump was faring poorly in the district, Price won his seat by a margin similar to what Reid tweeted. In 2016, Price, a longtime incumbent first elected in 2004, defeated his little-known Democratic opponent, 62 percent to 38 percent, a 24-point margin. Reid's original tweet said that in Georgia’s 6th district, "Trump won by 20+ points." Romney won by that wide a margin margin in 2012, and Price did, too, as recently as last November. But Trump was nowhere near as popular in the district as Reid’s tweet indicates. He won by a point or two -- far worse than Republican candidates have traditionally fared in the 6th. EDITOR'S NOTE, June 21, 12:55 p.m.: Shortly after this article was posted, a reader informed us that Reid had replied to a follower on Twitter that she may have gotten the statistic wrong. We have now included that in the article. Added on June 21, 2017, 6:11 p.m.
After our article appeared, Reid tweeted the following correction: "Correcting this tweet: Trump won GA 06 by 1.5; Price by 23. Thanks to all the tweeps who caught my mistake. Multibrains are better than 1! :-)"
Published: Wednesday, June 21st, 2017 at 12:34 p.m.